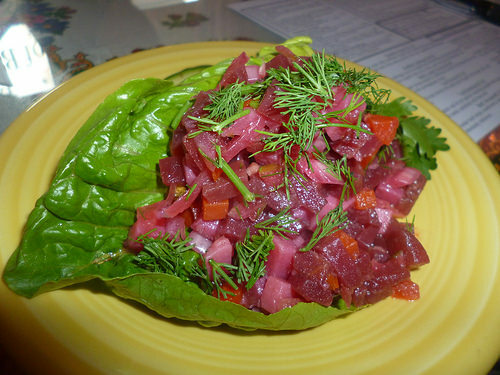 Love Cafe & Bar: Russian Home Cooking Comes to Kips Bay! Interior Photo Courtesy of Leigh Cort. All Food Photos by Anne Raso. 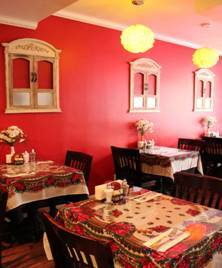 If you are a lover of Russian comfort food who thinks you have to hike it all the way out to Brighton Beach to taste Perogies and Chicken Kiev “like Grandma used to make,” then you will flip for Love Cafe and Bar, which recently opened in Manhattan’s up-and-coming Kips Bay neighborhood to astoundingly positive Yelp Reviews. And that says so much right there, because those Yelpers can be brutal. Kips Bay has been a bit of a culinary wasteland, so we love to see any new restaurants opening along that strip of Second Avenue between 23rd and 34th Streets, but to have a great new Russian restaurant owned and operated by a lady like Margarita Abramov — a native of Odessa, Ukraine — who literally cooks recipes handed down to her by her grandmother, Sara, is especially thrilling, because Russian food is awesome. Abramov previously operated the popular and highly successful Sara’s Crepe Cafe in St. Augustine Florida for many years before moving to New York and expanding her menu to include both sweet and savory favorites from her homeland. Love Cafe and Bar is an intimate, 18-seat establishment with bright red walls, charming decor, and a neighborhood feel, where you will be treated as if you are a valued member of the family. It’s this level of relaxed and friendly but attentive service which really sets Love Cafe and Bar apart from its peers. Here’s a peek at just a few dishes from their extensive menu which we sampled on a recent visit. 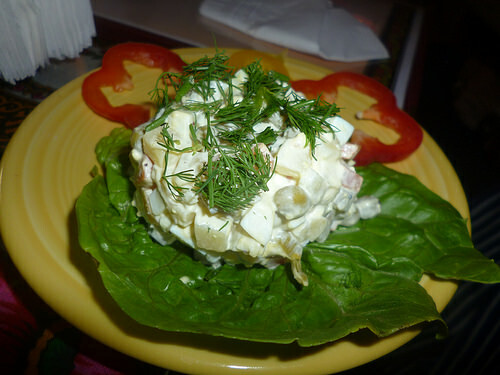 The Olivier Vegetarian Salad ($8.95) is a take on potato salad containing carrots, pickle, hard boiled egg and peas in mayonnaise-based dressing and garnished with plenty of fresh dill. We love Beet Salad so were delighted with the Vinaigrette Russian Beet Salad ($8.95) sauerkraut, carrots, onions, scallions, pickles, peas, potato and wine vinegar topped with more fresh dill. Super Fresh! 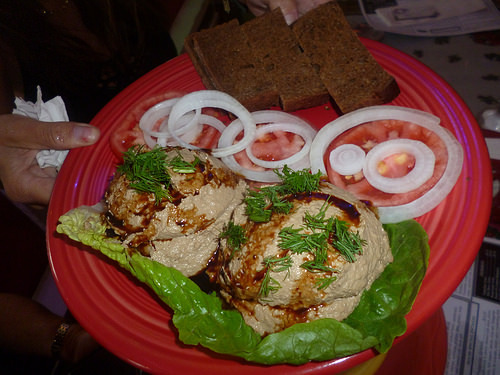 Chopped Liver fans will want try the House made Chicken Liver Pate Platter ($8.95) topped with pomegranate sauce and served with black Russian bread, tomato and onion. The serving is generous enough for the entire table to share. 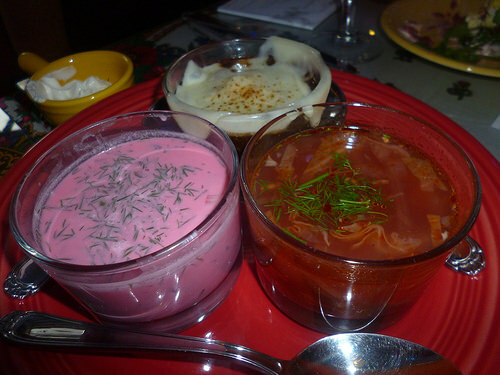 Margarita’s hearty homemade soups are a highlight of the menu and we sampled three varieties: Both Hot and Cold Borscht as well as traditional French Onion Soup complete with a thick topping of melted Gruyere Cheese. All soups are priced at $3.95 for a cup and $4.95 for a bowl. Perogies and Pelmeni (another kind of Russian dumpling) have their own section on the menu and you can’t visit Love Cafe without trying at least one variety! We had the Potato and Fried Onions Perogies ($8.50). 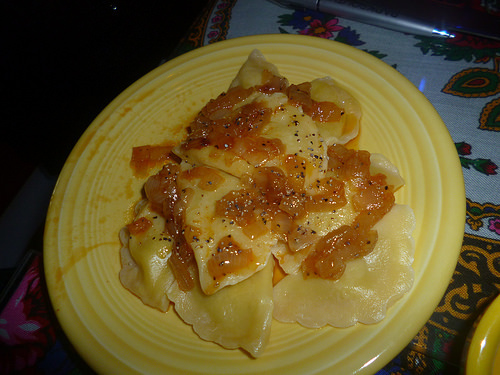 These are homemade daily and you will not find fresher Perogies in the city. Don’t skimp on the sour cream! 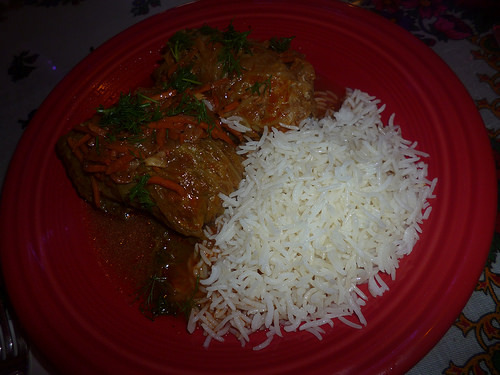 For my main entree I chose the much-raved about Stuffed Cabbage served with Basmati Rice ($14.95). This dish is big enough to share, featuring two cooked cabbage leaves wrapped around a filling of savory ground beef and pork, seasoned with garlic, onion and spices, accompanied by homemade tomato sauce and served with sour cream for topping. While each dish is made to order, the wait is very reasonable and the food is rich but not heavy or greasy. You can really taste the love as well! Other recommended dishes are the classic dish Chicken Kiev (Breaded chicken breast pounded, rolled and stuffed with garlic butter and herbs, $14.50), Veal Schnitzel ($17.95), and Beef Stroganoff ($14.95). Grandma Sara’s Dessert Crepes are a specialty of the house and we had the chance to try a couple of favorites. 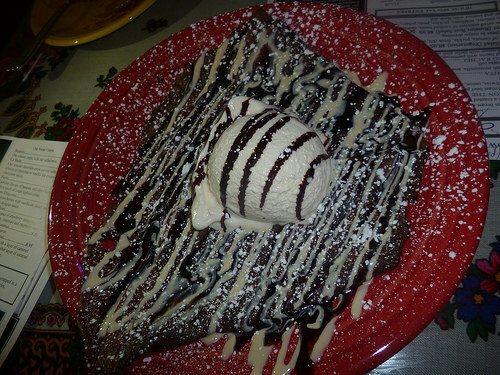 The Chocolate lovers choice is going to be La’Belle Chocolate Crepe, drizzled with chocolate sauce and dulce de leche and served with vanilla ice cream ($9.50). So decadent! 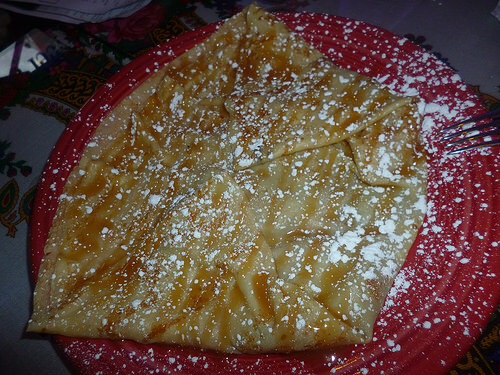 Another of Margarita’s specialties is the Crepe aux Pomme et Caramel ($8.95), a warm apple crepe with two layers of caramel sauce that is made individually from scratch with fresh apples! It tastes even better than it looks! Love Cafe and Bar serves Breakfast, Brunch, Lunch and Dinner. With so many favorite and tempting dishes left to try, we can’t wait for our return visit! 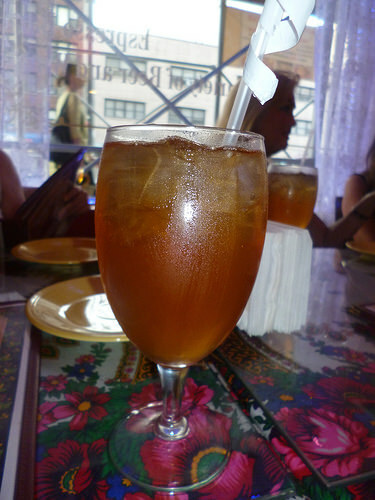 The Love Café and Bar is located at 430 Second Avenue (Between 24th and 25th Streets), New York, NY 10010. Hours are 8:00 AM to 11:00 PM Daily.Phone (212) 779-7300 for more information, and peruse their extensive menu at This Link.